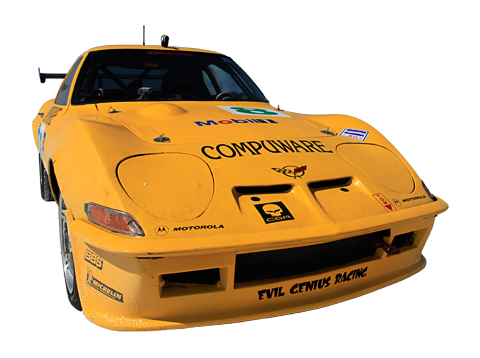 Team Tinyvette got its start at our local Goodyear tire store with a half-joking suggestion that we get an Opel GT, dress it up as a famous ALMS Corvette, and race it in The 24 Hours of Lemons. A quick search on eBay turned up two cars that were nearby and a few days later we were stuffing both of them into my carport. Nine weeks later the car rolled off the trailer at Thunderhill Raceway and by the end of that weekend we could look all at each other and say, damn, we did it. That was back in the summer of 2010 and since then the team has gone on to win its class and bring home several trophies. Up until 2016 it had has completed most of its races, having DNF'ed only twice, but struggled in 2017 with engine issues. In addition to racing in Lemons it got in a couple of runs at Bonneville, spent a month on display at the California Automobile Museum, has been in parades, occasionally auto-crosses, hits up all the local car shows, and more. Rumors are that it has even won the hearts of at least a few dozen people. Obviously there is a lot more to this story but rather than tell it here it would be better to just jump on over to the Team Tinyvette web site and see what else these guys claim to have done with this 49 year old Opel.